You probably you have that one obnoxious friend who has traveled the world and can’t shut up about it. Well, I fear I’m becoming that person, sharing all of these travel-inspired recipes lately. But that’s certainly not what I’m trying to do! I just can’t help but share the amazing and awesome food I experienced while away from the U.S.
There’s a lot of great food out there and I simply think you should know! One such dish being PATATAS BRAVAS. Oh, lordy. I would go BACK to Spain just to have patatas bravas. True story. It all starts with crispy quartered potatoes. Some versions are fried, I was not about to go there (#terrifiedofgrease). Plus, baked taste just as good if not better than fried. And you can have twice as many since they have half the calories – it’s science. If you want to keep this dish vegan, stop here. But if you’re up for another layer of flavor, bring on the Parmesan! I highly recommend it, as it’s a simple alternative to making aioli, which requires 5 more ingredients. Last but not least, HERBS! I went with cilantro, but parsley is perhaps more traditional. Besides adding more color, it adds freshness and an earthy flavor that I love. Make this a complete meal by adding a runny egg on top (seriously amazing). Otherwise, serve as a traditional Spanish appetizer or “tapas.” We ate these EVERYWHERE when we were in Spain. So good! They’re probably my favorite appetizer of ALL TIME. Sorry chips & salsa, you were good for a little while but…you’ve been replaced. 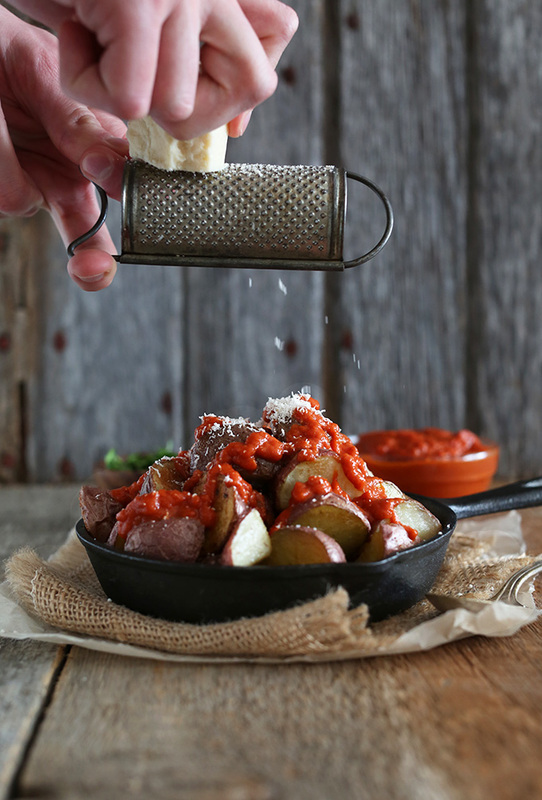 Classic patatas bravas, only healthier! 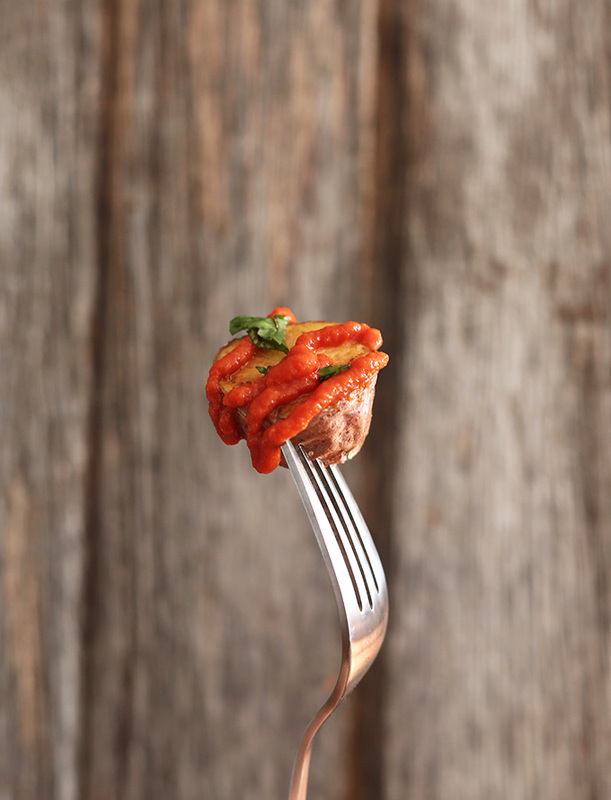 Baked crispy potato wedges topped with a spicy tomato sauce. Keep vegan by omitting aioli and cheese. Fresh herbs make a bright, earthy finish. 10 ingredients. Perfect for a crowd. Soak quartered potatoes in very hot water for 10-15 minutes. In the meantime, preheat oven to 450 degrees F (232 C). 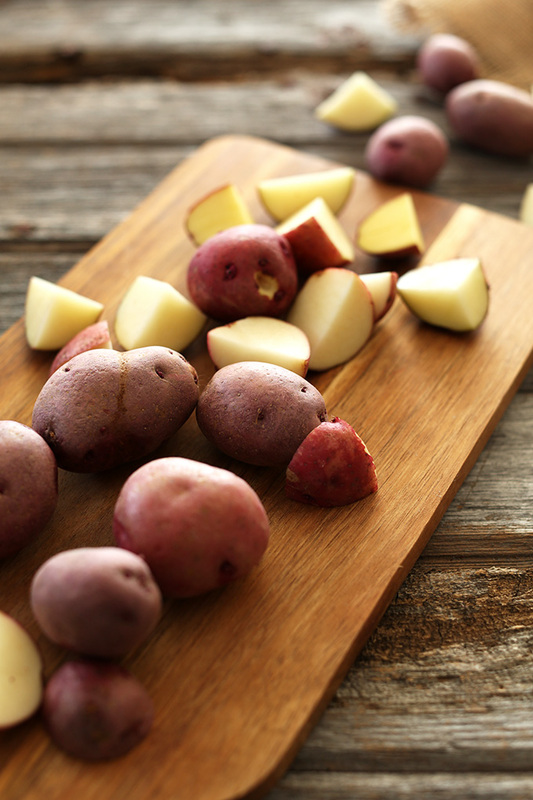 Once potatoes are soaked, dry thoroughly and then add to a baking sheet with olive oil and a generous sprinkling of sea salt and garlic powder. Toss to coat. Bake for 20-25 minutes or until golden brown and cooked through, stirring once. Test by spearing a potato with a toothpick – it should be relatively easy to push through. While the potatoes are baking, prepare your spicy tomato sauce. Heat 1 Tbsp olive oil in a large skillet over medium-low heat. Add onion and garlic and 1/2 tsp salt and stir. Cook for 7-8 minutes to slowly “sweat” until the mixture becomes translucent and very fragrant. If it begins brown, turn down the heat to low and stir frequently. Add paprika, garlic powder, cayenne and stir. Then add tomato paste, hot sauce and water and stir. Cook for 10-12 minutes or until simmering and the flavors are well blended. Reduce heat if it begins to bubble too vigorously. Taste and adjust seasonings as needed. I added more hot sauce, sea salt and garlic powder. For a smooth sauce (which I prefer), puree in a blender or food processor until smooth. Otherwise, set aside. Remove potatoes from oven and sprinkle with a bit more salt to taste. Place in 3-4 small serving dishes and drizzle with tomato sauce (as original recipe is written // adjust number of serving dishes if altering batch size). Optional additional toppings include vegan parmesan cheese, more hot sauce, and fresh herbs. 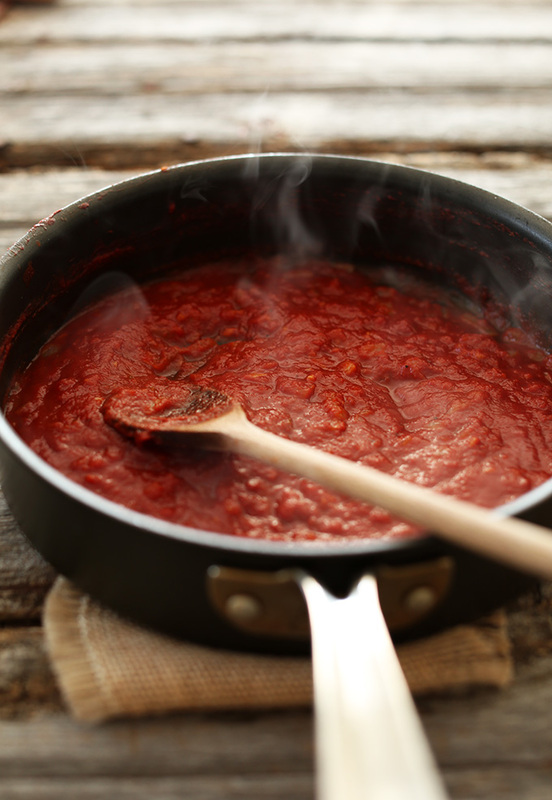 * You can sub 1 14-oz can crushed tomatoes and omit the water in place of 1 6-oz can tomato paste. * Nutrition information is a rough estimate. I made this – but only had little yellow potatoes, so I halved them. 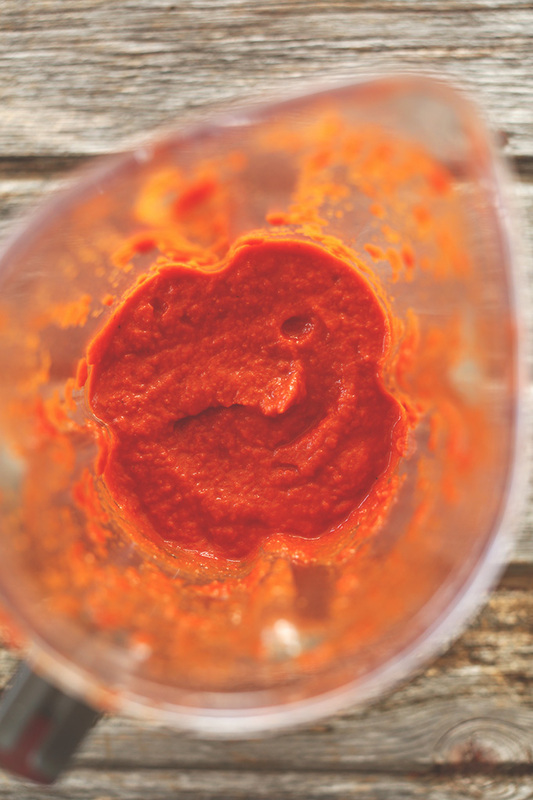 Did not have tomato paste, so I used sugar-free ketchup – my husband and I devoured them – the flavors were amazing!!! Thanks for sharing your recipe changes, Cindy! We’re glad you enjoyed them! Looks great! Except I’m really not sure why you would want to go and ruin a great dish with cilantro! YUCK! “And now we’ll just go and sprinkle some rancid soap right on top to finish it off”. I say this not in a mean way of course. As I’m sure you’re well aware, you either love cilantro or absolutely despise it. Thanks for the (rest of) the recipe! Excellent recipe, It´s served with brown rice. I made a double batch, tossed it all together and served as a warm patatas-salad. It was a big hit! Thanks for sharing the recipe. As part of a (potato) challenge, I have been making potatoes for a weekly dinner with friends since August of last year. I made these as part of “Spanish Food” night. They were very good. I modified the recipe a little bit and found that mixing the potatoes with the tomato sauce and baking them for another 10 minutes really make the potato bites pop. At dinner, the potatoes were gone in a flash! I made these for the first time tonight sans cheese or egg as I am not quite two months vegan. They were amazing. I topped the papas with black beans and then the sauce…it was a freaking mouth explosion. I seriously needed a moment after my first bite to contain myself. So. Damn. Good. I cannot say enough, except maybe thank you. We tried this tonight. Worked amazingly. Everyone loved it, including our kids. 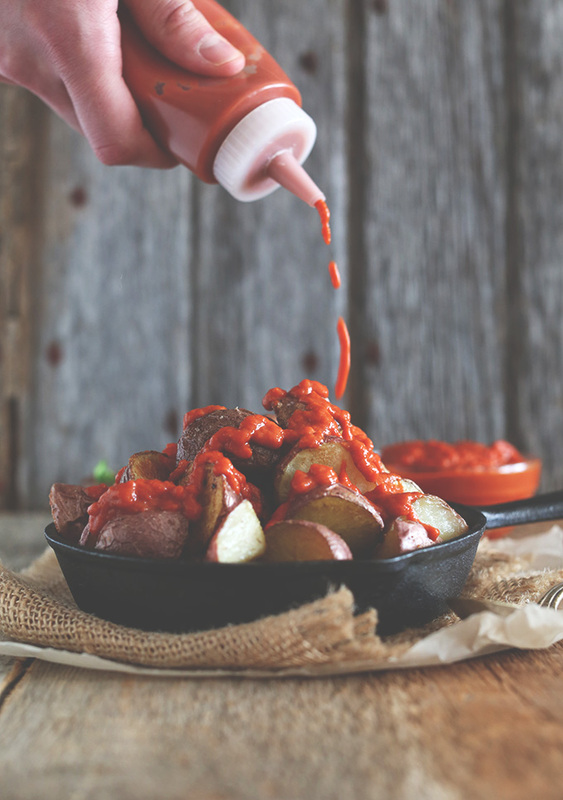 We are addicted to the Patatas Bravas at Jose Andres’ Jaleo with the aoli, but were looking for a lighter, easier version to cook at home. A+. The potatoes were wonderful! I’m not so sure I need the sauce, even though it’s not real patatas bravas without sauce. Anyway thank you for sharing such a simple yummy recipe! Wonderful – thanks for sharing Dee! Made these last night for my family’s semi-regular potluck potato night, and they were a hit! 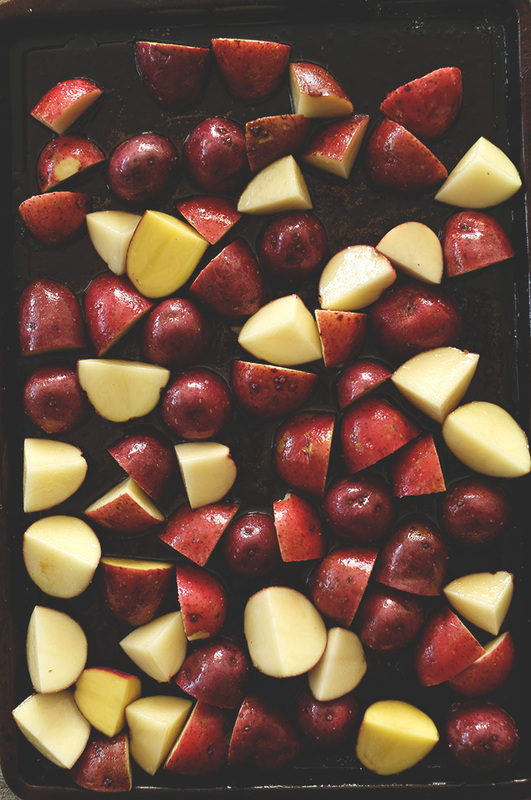 Quick Q though – what is the goal behind the hot water soak instead of just roasting them from raw? I’m guessing to get the starch to the outside. What hot sauce did you use? Just made these for dinner tonight. I have been all about potatoes lately so these were absolutely perfect served alongside a fried egg and kale! Smart girl! Glad you enjoyed these. Thanks for sharing, Hannah! 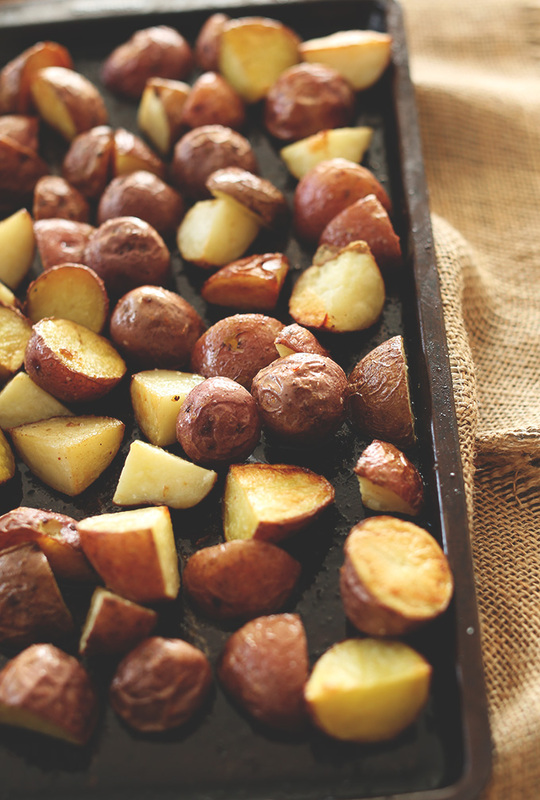 I had been eyeing this recipe since it was posted so I could get rid of some potatoes (it’s just my husband and me and a bag of potatoes is always too much!). But it seemed more like a side dish and didn’t really go with anything I’ve been making. But tonight, I was making a swiss chard frittata and this popped into mind. We just finished eating and absolutely loved these potatoes! They were the perfect side for something on the lighter side. I added a tablespoon of sun dried tomato pesto to the sauce. Once again, an amazing recipe! Thanks! 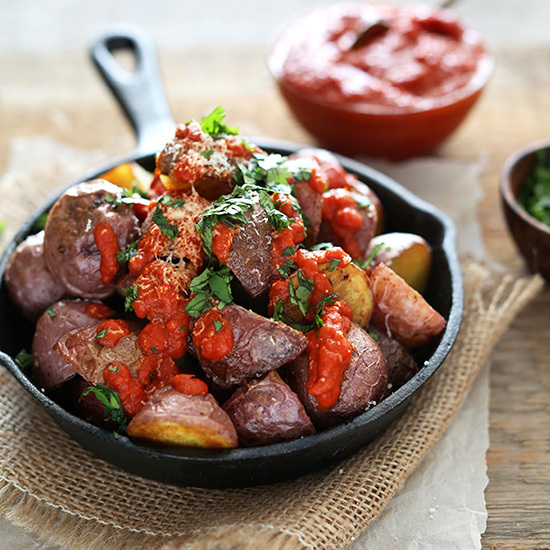 This look nice… but they have nothing to do with the original recipe for patatas bravas. We dont leave the potato skin, the sauce is not made with tomato, the haven´t got chesse and so on. Oh yes please. These were the best part about my trip to Spain. I can absolutely never get enough of patatas bravas… they’re my favorite thing to eat when in Spain, literally ate them at every meal! These look amazing, though I do prefer the ones with the garlic aioli mixed in as well. the aioli is legit, right! I wanted to keep these to 10 ingredients, but if I make them again, I’ll probably attempt a vegan aioli version! Hi Dana! This recipe looks amazing and with a sister being THE biggest potato lover, I will definitely be making these soon :D By the way, I just wanted to point out that I think you may have made a typo, when you wrote “Plus, baked taste just as good if not better than baked.” I think you might have meant better than fried? Good catch! Thanks, Winter! fixed. Oh heck yah! This looks so very good-and so very do-able! Thank you, for you and your husband for sharing good stuff. This dish looks amazing! Definitely something that my sister (a total potato lover) would go crazy for. I LOVE these photos and graphics! Awesome job. Thanks Abbie! You are seriously the sweetest. Thanks for the kind words and always commenting! It makes my day. Oh cool! We didn’t make our way down that way, but we must come back and visit because Spain is just breathtaking. So jealous you get to live there year-round! Yummeh! Could you eat these with a poached egg on top? The Spanish are so great at this kind of simple but tasty food. I studied in Spain for a semester and there was a little bar at the end of my road where you could actually order your free tapas … patatas bravas was one of my favourites! Patatas braves are my favorite tapa! I have so many memories of sharing these with friends after a night of too much drinking! Although I must eat these with a side of aioli. I can never resist ordering a massive plate of patatas braves when we have tapas and then devouring the whole thing myself. This looks dangerous. ’tis. I probably gained 5 pounds in Spain JUST from Papas. So good! p.s. if I’m ever across the pond again, let’s meet up! 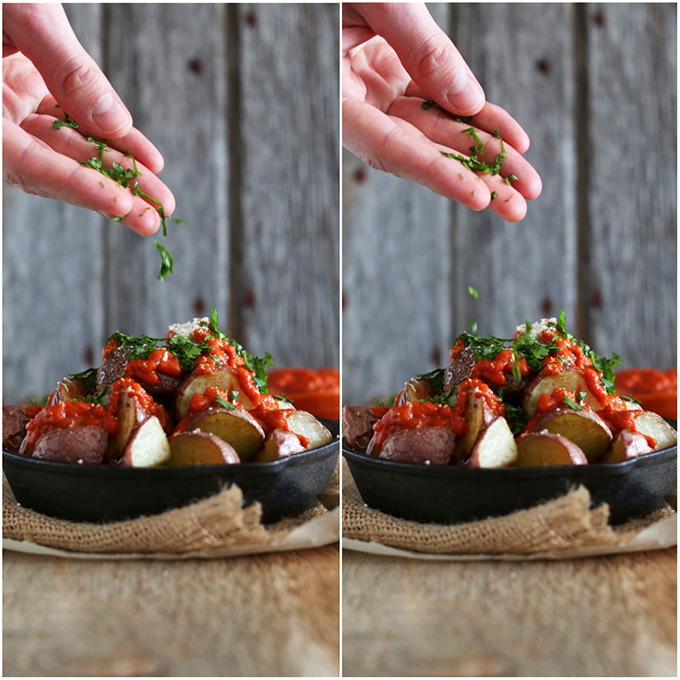 Bring on the patatas bravas (+ parmesan and herbs, por favor)! PS. I totally love that you’ve been sharing all of these travel-inspired recipes from places that I haven’t travelled myself (aka. everywhere). Ah, thanks Amanda! I was beginning to feel a little heavy on the travel-speak. But this recipe was my last one from our recent adventures! Promise :D Hope you get to travel someday! It’s the bayst. I discovered these when my brother used to live in Spain and fell in love with them instantly ! They are my favorite tapas of all times… I usually go with both the tomato sauce and the aïoli and it is sooo good. 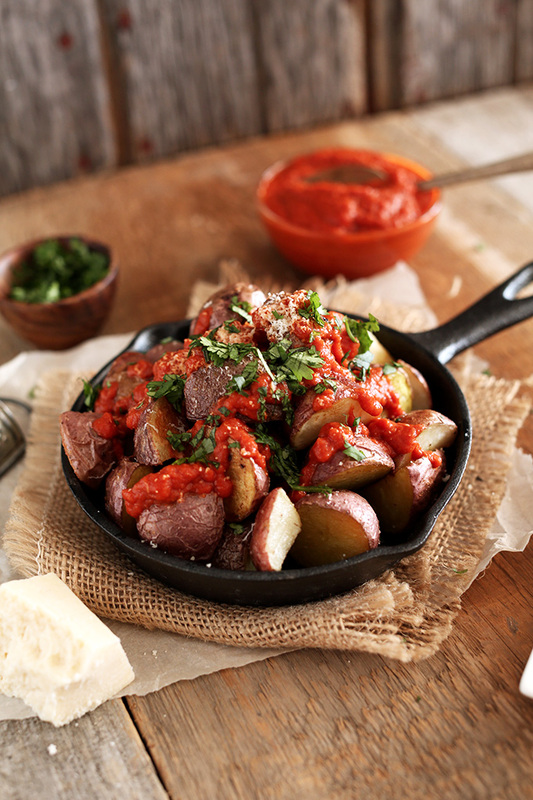 Yours look great and you’ve made me crave patatas bravas now… Need to go buy some potatoes… Quick ! Hi, Greeting from Granada, Spain. A little tip you may find useful, here in Spain the potatoes are usually peeled, cut, then boiled in salted water for 5 minutes only, drain, place a lid on the pan and shake well, this will rough-up the surface of the potato and it will help absorb much more flavour. I am in love with your photography! Now I have to go get some potatoes to make this. Looks delish! Ah, thanks Chandra! So sweet of you to say. Hope you enjoy this dish! It’s seriously bomb-tastic. I probably ate about 40 pounds of patatas bravas while studying abroad in Madrid! Thanks for a great recipe! Yep, me too! I had to eat green smoothies for a week to lose my papatas pounds :D No shame though! That backdrop looks familiar! :) I love patatas bravas. I’m a fan of all potatoes with tomato sauce, really. See you tomorrow! It’s dee one I got witchoooooooo! ;D Fun times. More fun times to be had TOMORROW. See ya then. you make me blush and happy dance all at the same time. HOOGZ! I love my friends who talk about nothing but travel (and I am one of them), especially when the talk turns to food! So, bring on the travel-inspired recipes. I’ll never get sick of them. Also, anything with roasted potatoes is just fine in my book. Haha, thanks Nora! Appreciate the license to share :D I’ll probably be doing more of it as more adventures come. Cheers! whoop! i was just wondering what to do with my big old stockpile of potatoes… problem solved. these look awesome! keep the traveled-inspired recipes coming! Patatas braves are pure comfort food. Carb love! i love travel inspires stories..since i dont plan on going anywhere its nice to see delicious food like this one. Being a potato lover, I could see myself inhaling this pretty quick. This looks so good!! Any kind of potato makes my freaking day! Oh yum! 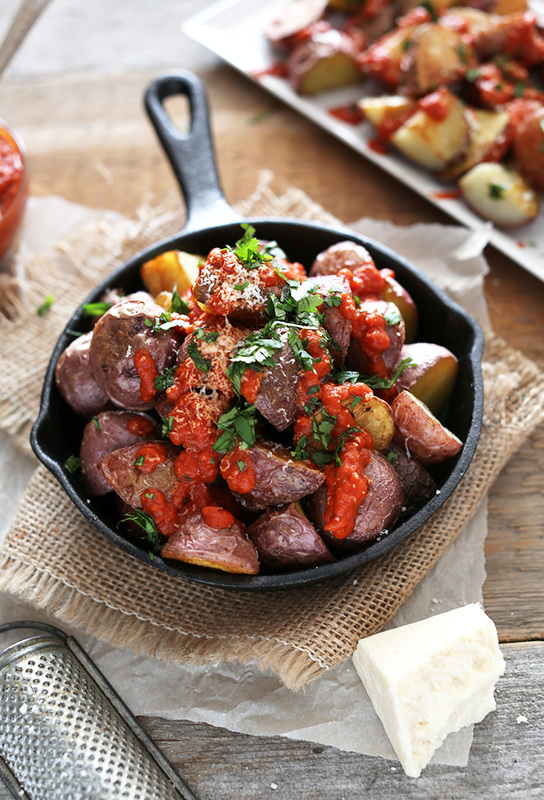 I love a comforting bowl of potatoes….even better if they’re slathered in something spicy. Pretty punny, right? All right, I’ll stop now. All lame jokes aside, my potato loving husband would propose to me all over again if I made him these things. That is his ideal meal. Pinned, so it’s locked and loaded in my recipe arsenal! Seriously, these look awesome! So jealous of the different foods you have been able to try, but happy you are sharing about them!! Love all the action shots! Thanks Tieghan! I could go on and on about your photos, too! You’re such a talent! 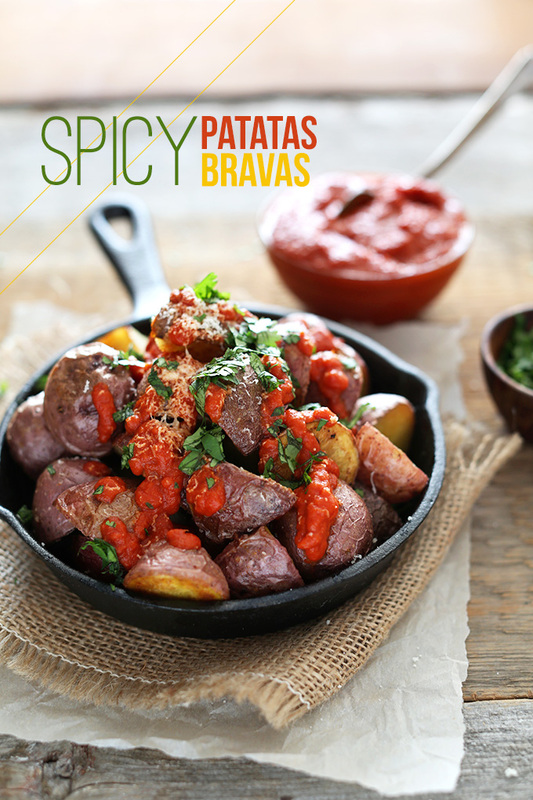 Bravo on the bravas, these look perfect! I’ll take them for breakfast, lunch and dinner, pleaseandthankyou! 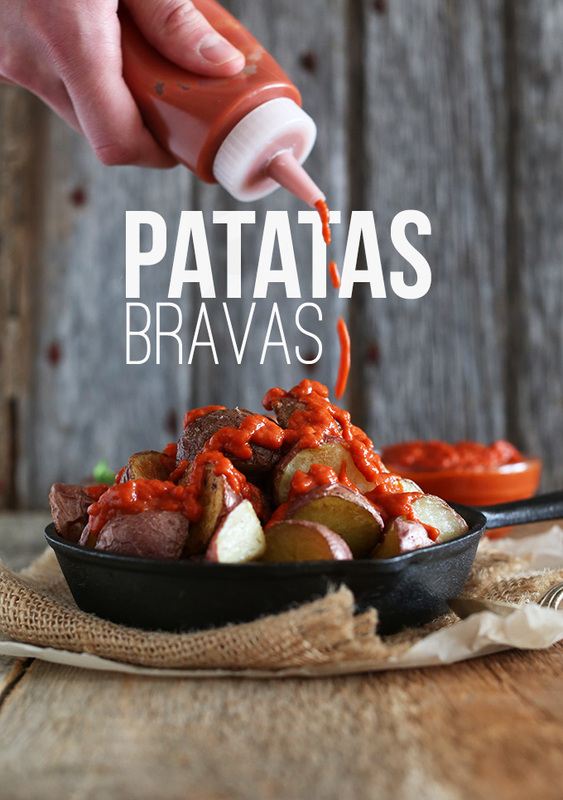 Patatas bravas!!!! MMMMM! Viva Madrid! Home of the best!